Since February 2015, Lokad strongly recommends not to use service levels anymore. Indeed, service levels are hard to optimize, and usually poorly reflect actual business priorities. Lokad has introduced a more capable forecasting technology, namely probabilistic forecasts, where the service levels don't need to be provided as inputs any more. This technology delivers superior results and is strongly recommended. When quantile forecasts are used, the reorder point is computed as a function of expected demand, lead time and service level. The reorder quantity is computed as the reorder point minus the stock on hand and minus the stock on order. The service level represents the desired probability of not getting a stock-out. The following article gives a short introduction to the topic and guidance on how to set appropriate service levels. The implicit assumption within this statement: It is not economic to always be able to service an order from stock on hand. Deciding on the right service level for a certain product is essentially balancing inventory costs vs. the cost of a stock out. Service level is therefore an important variable for calculating the appropriate safety stock; the higher the desired service level, the more safety stock needs to be held. Unfortunately, the cost functions describing the problem are extremely very business specific. While inventory costs can often be determined rather easily, the cost of stock outs are much more complicated to determine. A customer that does not find the product in store might either choose an alternative that is in store, postpone the purchase to a later date or buy at the competition. In grocery retail for example, out-of-shelf situations of certain must have products are known to drive customers out of the store, taking their business to a competitor. As this example illustrates, the associated cost functions are not only business, but product specific. When considering that most manufacturers and retailers are dealing with hundreds to hundreds of thousands of products, it becomes obvious that an overly scientific approach is not advisable nor feasible. The good news is that in practice it mostly proves fully sufficient to work with a simple framework that can be fine-tuned over time. Service levels are considered by many retailers as part of their core IP, and tightly guarded. Nevertheless, some ballpark figures should provide a good starting point: A typical service level in retail is 90%, with high priority items reaching 95%. We have seen a number of customers successfully choosing a very pragmatic approach when setting service level at a uniform 90% starting point, to subsequently improving and adjusting these to their needs. It is important to understand the relationship between service level and safety stock. Graph 1 illustrates the relationship. Dividing by 2 the distance to 100% multiplies the safety stock by 2. For example, if an increase in service level from 95% to 97.5% will double the necessary safety stock. 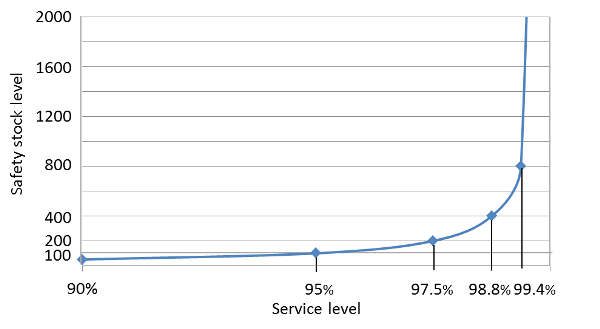 Service Levels approaching 100% get extremely expensive very fast, and a service level of 100% is the mathematical equivalent to infinite safety stock. Product rankings allow a structured and sensible way to allocate products to the categories we defined previously. Rankings that are often used solely or in combination include turnover, profitability, number of orders, COGS (cost of goods sold). Once the categories have been defined and service levels have been assigned, Lokad will determine the reorder point (including safety stock levels) as a function of theses values. We often see that a lot of potential for inventory reduction is not only leveraged by the accuracy of our forecast, but also by the more sophisticated method and frequent update of the service level. Who still feels rather insecure regarding the correct service level to be entered into Lokad should remember that it is not important, and also rather unrealistic, to have the perfectly fine-tuned service levels right out of the gates. What is important is that the new attention to this notion, in combination with Lokad forecasts and reorder point analysis, will improve the status quo with a high certainty.